Multi-Function Wire StripperEasy stripping without any adjustment.Come with self-adjusting jaws ideal. Multifunction,made of steel by special hardened and using life-time.Specially designed and precisely-machined toothed grapple can grip and fix the wire tightly. 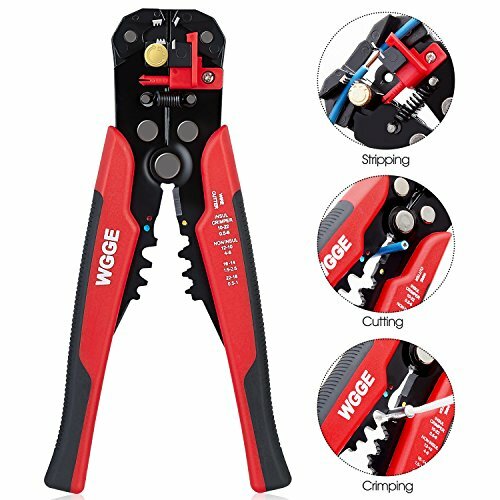 A wire crimping tool (crimper) which crimps insulated and non-insulated automotive ignition terminals and includes a wire cutter saving you time and money purchasing individual tools. Cable Crimping/CuttingFor stripping wire from AWG24-10(0.2~6.0mm):1. Alloy steel jaws: Hardness (HRC 55~ 60 ) for all types of wire from 10AWG to 24AWG gauge(0.2-6.0mm) 2. The cutter are made by special heat treatment and precision coating high quality blade performs efficient cutting 3. For insulated terminals 22-10AWG(0.5-6.0mm) 4. For non-insulated terminals 12-10AWG(4.0-6.0mm), 16-14AWG(1.5-2.5mm), 22-18AWG(0.5-1mm). Non-Slip Comfort GripTouch grips provide maximum comfort and reduced hand fatigue. Plastic & cushion grip handle, provides maximum leverage (PP& TPR) and increased comfort making the grip Self Adjusting. W&G Global Electronics Inc. mainly produce Test lead with Alligator Clips, HDMI Cables, Banana Plugs, Wire Strippers and so on. We only provided high quality and good price products to each customer. Micro adjusting the swivel knob to strip electrical wire gauge up to 24AWG(0.2mm). The strippers will not damage the metal part of electrical wire. And self-adjustable strippers with aware stopper for desired stripping length. Easy stripping without any adjustment. Multifunction,made of steel by special hardened and using life-time.For stripping wire from AWG24-10(0.2~6.0mm):1. Alloy steel jaws: Hardness (HRC 55~ 60 ) for all types of wire from 10AWG to 24AWG gauge(0.2-6.0mm) 2. The cutter are made by special heat treatment and precision coating high quality blade performs efficient cutting 3. For insulated terminals 22-10AWG(0.5-6.0mm) 4. For non-insulated terminals 12-10AWG(4.0-6.0mm), 16-14AWG(1.5-2.5mm), 22-18AWG(0.5-1mm).For auto ignition terminals 7-8mm. For striping the plastic or rubber insulation of the single, multiple cables and wires of 0.5-6mm.For cutting and stripping wire and cable .